It's the time of year when the trees turn red. Tamaki Ugaya, an ordinary high school student, goes to live with her grandmother in the Ugaya Family home while her parents are overseas for work. Tamaki arrives at Kifumura village, surrounded by nature. Her childhood memories guide her towards her grandmother's house but she is immediately attacked by monsters. The one who saves her is the surly boy, Takuma Onizaki. 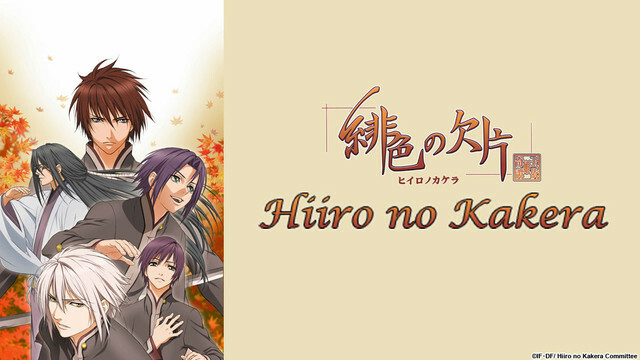 Hiiro no Kakera is a Japanese visual novel created by Idea Factory directed at the female market known as an otome game. The protagonist is a teenage girl (Tamaki) who revisits a small village, she remembers from her childhood and gets caught up in her family's history and supernatural dangers surrounding it. While walking along the hillsides waiting for the person who her grandmother sent to fetch Tamaki to the village, Tamaki comes across a small, white round object with sticks for limbs and talks. Its runs off soon after, with Tamaki chasing after it. Soon Tamaki finds herself in a place where 'it doesn't feel like the world I came from'. She gets attacked by three slime creatures, and a male comes charging in to save her - by clamping his hands around her body and mouth and telling her to be quiet.